I was deep in the heart of Chippewa territory in the Upper Peninsula of Michigan when I started reading most of this book. It was a perfect setting to keep me turning the pages of this history laden story. 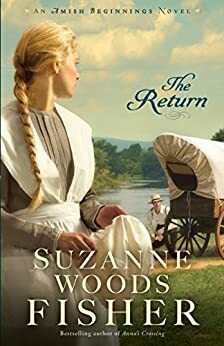 Suzanne Woods Fisher interweaves suspense, controversy, romance, history, and faith in such a way it grabs and keeps you on the edge till the end. Inspired by true events she didn't leave out a thing when describing the way of life for these newcomers, especially the danger that could be around every corner. There were so many great characters in this book, but my favorite character had to be Tessa. Her story is one of the ages regarding growing up and finding true love. A story that we all can relate to. Such a wonderful, wonderful read that I want to read it again! This is book 3 of the series Amish Beginnings but I feel it can be read alone. You can read my review of Amish Beginnings Book #2 The Newcomer here. I received this book free from Revell. I was not required to write a positive review. All opinions expressed here are my own.